Mstislav Dobuzhinsky was a Russian graphic artist, painter and stage designer born on August 14, 1875 in Novgorod to the family of an army officer. He first studied art from 1885 to 1887 at the School of the Society for the Encouragement of the Arts, St Petersburg, and then enrolled in St Petersburg University from where he graduated in Law in 1898. Unwilling to give up his early interest in art, in 1899 he went to Munich to study under Anton Azbé and Simon Hollósy. There he encountered a large colony of Russian artists, including Igor’ Grabar’, and also discovered the work of German Jugendstil artists. Following his return to St. Petersburg, Dobuzhinsky joined the artistic society “The World of Art”. He first collaborated with the society as an illustrator of books and magazines, and from 1903 took part in The World of Art’s exhibitions. The main subject of his works was “The City”, and he managed to show his understanding of St. Petersburg as a composition of classical architecture contrasted with the ugliness of urbanization. Cityscapes of different towns and cities became his main theme. From 1910 Dobuzhinsky travelled abroad each year, visiting Britain, France, Italy, Germany, and Holland. He was a good teacher and taught in different schools and studios. In the late 1900s he tried his hand at stage design, and in the 1910s-1920s completed a great number of illustrations for books. In 1918, Dobuzhinsky supervised the theatrical workshop at the State Educational Workshops of the Decorative Arts (the former Stieglitz School of the Technical Drawing). Between 1923-24, he went abroad to study developments in European art and to arrange one-man shows. 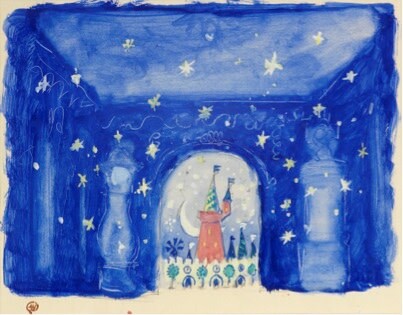 In 1924, he emigrated to Lithuania, and in 1939, to the USA, working primarily as a stage designer.